On July 16, 2014, the Supreme People’s Court of China (SPC) published a draft of judicial interpretation regarding patent disputes: the Decision on Amendments to Several Provisions of the Supreme People’s Court of China on Issues.Concerning the Application of Law in the Trial of Patent Dispute Cases (Draft for Public Comments). The draft of the amendments was open for public comments during a one‐month period until August 15, 2014. The Draft for Public Comments involves amendments to 9 provisions, among which 2 concern patent evaluation reports, 1 concerns patent protection scope, 4 concern compensation for patent infringement, and others are adaptive amendments to correspond to the current Patent Law and its Implementing Regulations. a)for any litigation claiming infringement of utility model patents filed before October 1, 2009 (exclusive), the plaintiff may submit the Search Report made by the Patent Administrative Department of State Council; b)for any litigation claiming infringement of utility model patents or design patents filed after October 1, 2009, the plaintiff may submit the Patent Evaluation Report made by the Patent Administrative Department of State Council. Significantly, the People’s Court may ask the plaintiff to submit the Patent Search Report or Evaluation Report, and the failure to do so without good reason may result in a cessation of the litigation, which means the court may suspend the case. This is an adaptive amendment to correspond to the amendment of the PRC Patent Law in 2009 regarding the Patent Evaluation Report. This means the function of the Patent Evaluation Report becomes more important. The major motivation for this requirement comes from the fact that the SIPO does NOT conduct substantial examinations in design and utility model applications. The Search Report and Patent Evaluation Report are a substantial examination conducted after the patent is granted, and will give the court a sense of the validity of the patent. 4. The definition of “losses caused by infringement” in infringement compensation is further defined: the patentee’s actual losses caused by the infringement may be calculated by taking the reduction of sales volume of patentee’s patented product caused by the infringement and multiplying it with the reasonable profit of each patented product; where the total amount of reduction of sales volume is difficult to determine, the multiple of the total sales volume of the patented product in the market and the reasonable profit of each patented product may be regarded as the actual losses of the patentee caused by the infringement. 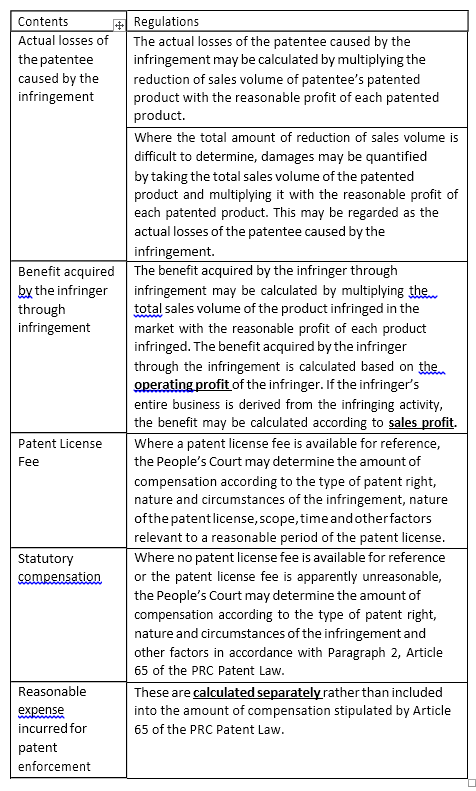 The definition of “infringement benefit” in infringement compensation is also similarly defined: the benefit acquired by the infringer through infringement may be calculated by multiplying the total sales volume of the infringed patented product in the market with the reasonable profit of each product infringed. After these refinements, the methods for calculating damages for infringement are more precise. In particular, the provisions with respect to the reasonable expenses incurred in stopping infringement being separately calculated rather than being included into the infringement compensation will encourage the patentee to obtain more convincing evidence of infringement and infringement compensation. We believe this will increase the infringement costs of the infringer and help deter infringement. Before this draft was released, the court generally included the reasonable expenses incurred for stopping the infringement into the damages calculation, which could result in a low amount of compensation for enforcement costs. Now the Supreme Court explicitly specifies that the reasonable expense shall be calculated separately. We believe this may enable the patentee to recover more damage from the infringer. The Draft for Public Comments may be regarded as a move to affirm the “all‐elements” principle. This move shows that there is a consensus regarding the “all‐elements” principle in the court, which means that all the technical features in the claims will be considered. In the past, there have been cases wherein one component defined in the independent claim have not been considered in the infringement litigation because the court believed that that component was superfluous as it related to the technical problem. After this amendment, the “principle of superfluousness”represented by the description of “essential technical feature” in all existing judicial interpretations will become a thing of the past. This development also reflects the importance of reviewing claims from all aspects. Each technical feature in the claims will be subject to comparison in an infringement analysis. There will no longer be any difference between essential and non‐essential technical features when determining infringement of a claim. Strategies for Responding to Office Actions for Claims Based on Computer Programs. Recently, we received a notification on the grant of a patent right for an application seeking to protect a computer program. In the first office action, the examiner rejected the patent application on the ground that none of the claims of the application fall under patentable subject matter as provided in Paragraph 2, Article 2 of the PRC Patent Law. After receiving the first office action, we noticed that the claims in the application contained descriptions of computer programs such as “first programming language,” “second programming language,” “first program code,”“second program code” and the like. If the claims in an application directly define “computer program” and seek to protect any method relating to the same, the examiner will often reject the application for the sole reason that the application relates to “methods for mental activities” or “human defined rules.” Therefore, the preferred practice to adopt is to modularize the specific computer program and to define the computer program by identifying the functions of each module or method for executing the program. The examiner declared that the application was neither directed to a technical problem, nor utilized a technical means, or achieved any technical effect. In response, we argued that the technical solution of the application might solve at least three technical problems in prior art. After pointing out the specific technical features of the independent claims, we emphasized that the application indeed identified a technical solution. We submitted the above reasons to the examiner without amending the claims. After reviewing our response, the examiner withdrew his preliminary objection that none of the claims of the application belong to patentable subject matter. In a subsequent office action, the examiner held that none of the claims of the application possessed any inventive step. After reviewing the references cited in the office action, we found an obvious difference between the references cited and technical solutions of the application. Our response was filed to distinguish these cited references from our claims, again without amending the claims. After reviewing our response, the examiner removed his preliminary objection that none of the claims of the application possess an inventive step. In the third office action, the examiner raises formality issues such as a lack of antecedent basis and indefinite descriptions. After reviewing our submissions, the examiner allowed the application. Patentable subject matter according to Article 2 of the PRC Patent Law has becoming a popular issue frequently raised by examiners at SIPO. SIPO has always been conservative in this regard, which has resulted in an increasing number of applications being rejected. On the issue of patentable subject matter, the most common practice for dealing with the issue is making formality amendments. For example, a claim related to a method for the treatment of diseases may be amended into a claim related to pharmaceutical use. For claims related to computer software, especially claims related to methods for commercial use, although these claims may be amended to protect systems related to computer software and the like, these claims cannot pass though the examination under Article 2 of the PRC Patent Law. Therefore, after receiving an office action related to the non‐statutory issue, a patent attorney must thoroughly study the technical solution described in the application to identify technical problems underlying its commercial use. The patent attorney must then explain to the examiner the technical problem the application might solve, the technical means it utilizes and the technical effect it might achieve. The goal is to prove that the solution utilizes natural rules and corresponds to technical solutions governed by the PRC Patent law.